Better to start with when not to go. It ought not to come as any great surprise that in summertime the Sahara is a place to avoid. Even on the northern or Atlantic edge of the desert (above 30ï¿½N) daily temperatures will top 40ï¿½C on most days. In the interior nights will never cool and the daytime temperature will exceed 50ï¿½C. These temperatures are not unusual elsewhere in the world of course, but when you add the element of remoteness that's inherent in Saharan travel, summer is just too risky for first timers and not much fun besides. Consider that the relentless heat puts a permanent strain on your body as well as your vehicle. Unless you're installed in an air-conditioned car, daily water consumption will top ten litres so that a hefty 100-litre payload would not even last two people five days. The effects of these sorts of temperatures are hard to describe until you've experienced them – and then the full force of the pitiless desert is brought home. And it's no easier for your vehicle. Camel caravans never cross the desert in high summer while a car or bike's tyres and drivetrain will easily overheat just doing simply what it has to to get through. Vehicle failures are common in the hot season; a time when even locals can perish in the desert. If the Sahara can ever be said to get crowded with tourists it's around Christmas/New Year when Swiss, Germans and French make the most of their holidays and grab a bit of winter sunshine. In December and January Algeria, Libya and Mauritania experience warm days with clear skies. The shortness of the day is the drawback; at 30? latitude (southern Morocco, Ghadames, Cairo) days are only ten hours long. Ten degrees further south (Atar, Arlit, Zouar) you'll get 11 hours of daylight. Temperatures might exceed 30ï¿½C only for a couple of hours in the day but you'll generally only have freezing nights at altitudes of over 1000m. However, although the ‘baking days, freezing nights’ idea of the Sahara is an exaggeration, winter temperatures do drop considerably after sundown whatever your altitude, so woolly hats, fleece jackets and decent sleeping bags all come in handy. In the Moroccan Atlas snow will regularly fall above 2500m with occasional blizzards covering a much wider area. Temperatures on the Hamada du Draa will only creep up to 25ï¿½C while it's best to expect some rainfall along the Mediterranean coast. In these sorts of temperatures you can easily get by on less than a litre of drinking water a day which means less to carry and a lighter vehicle, something that's critical on motorbikes and pushbikes. You may grumble about the cold in the early morning but you'll have little chance to complain about the heat. 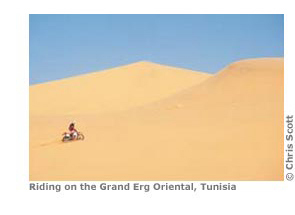 This can be a warmer time to visit the northern Saharan countries of Tunisia and Morocco, though further south the change of the seasons brings temperamental weather in April and October. Many seasoned Saharans consider November to be an ideal month deep in the desert. Days are still long but not desperately hot: 35?C in the low-lying Tï¿½nï¿½rï¿½, about 30?C in mountain areas. Nights aren't too cold and from Libya to Mauritania the strong winds bringing a horizon-blurring haze are rare. The autumn is also the best time to cross the Sahara if you're heading across Africa; at this time you're driving into the winter and then into the Central African dry season. Spring can be a gamble. Anything beyond March can bring on le chaleur and the onset of summer from Egypt to Mauritania. There's more on the climate of the Sahara on p.384.